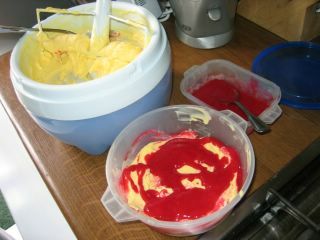 This recipe for raspberry ripple ice-cream comes from Nigella's Forever Summer, and is simple, yet wildly delicious. 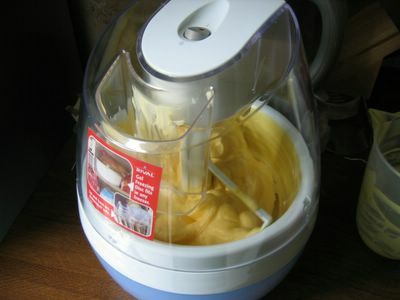 To start, you make a basic custard, and churn it in an ice-cream maker. Whilst that's going, you make up a purée of raspberries, sugar and balsamic vinegar, strain it, and put it in the freezer to cool down and thicken. Then you layer the custard and the purée in a container, and put it in the freezer to set hard. The finished product is absolutely delicious! 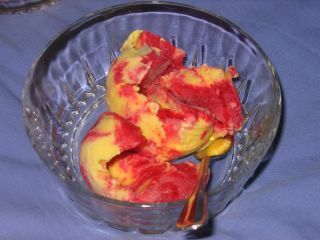 It is more than what you would expect from raspberry ripple ice-cream, but rather a homespun combination of custard and raspberry flavours captured in ice-cream form - in other words, it is heaven.